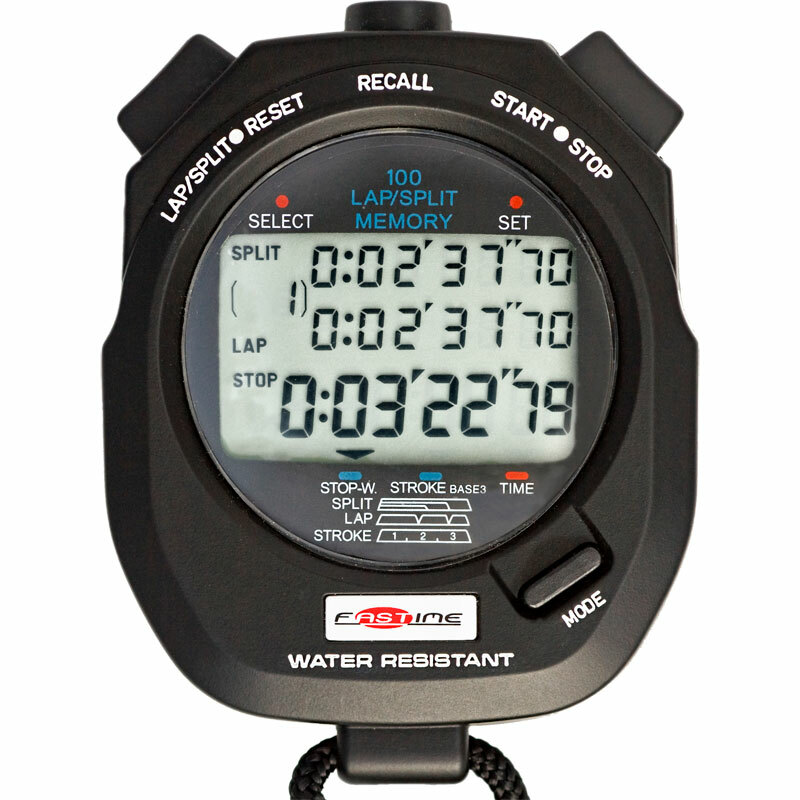 The Fastime 9 Stopwatch is ideal for swimming or rowing. Stopwatch, Stroke rate, Time, day date display. Stopwatch:Measures up to 9hrs 59mins 59 secs 99/100ths sec. Triple display shows: Cumulative and Lap split time to the last split. Cumulative running time. 100 cumulative and split times can be stored in memory. Time out (start, stop, resume) function is also included. Stroke Rate:Measures a sample of 3 strokes or actions and returns a frequency or rate per minute. Press the start button to begin measuring the stroke rate. Display counts down from 180.Press again after 3 strokes and the display shows the rate per minute. Time of day display: Hour, minute, seconds time of day with 12/24 hour option. Year Month Day Date. Have ordered these before - the best price to be found online, though on occasion the stopwatch does sometimes stop working if dropped lightly. But best not to do that! This is my second one of these. Easy to use stopwatch, buttons nicely positioned and positive when using watch. Need reliable stopwatch for officiating at swimming galas. 5 out of 5 stopwatch for rowing. Excellent product, excellent service from purchase to delivery-will use Newitts as first outlet for sports equipment in future. Many thanks, Clive Cooper-rowing coach- Leander Club. As stopwatches go this is a good one. Prompt postage and a good price! Reccomend! A better product than I planned to buy at the price I had planned to spend. Great service and great product. I was looking for a good stop watch, and this one is perfect for what I need. It arrived ontime, and the packaging made sure it would not be damaged. The stop watch enables me to time many crews racing over set distances. I can save and recall their times as well as switching modes to check on their stroke rate. I like the separate buttons where one start and stops the timer and the other button gives the split times. This saves accidently stopping the watch. During the timed pieces I can also recall times without stopping the overall time.